My first experience of Apple was through the Mac OS 9. Compared to whatever Windows version we were using then (’98, ME, 2000 etc.) I found it far more elegant, trust worthy and classy. Yes, one had major compatibility issues when it came to file transfers, network sharing etc. I even bought a copy of DAVE – a software that helped Windows & Mac share files and printers. Now of course, such problems don’t exist. The love for Apple design and the ‘process’ only multiplied several times since the launch of Mac OS X, right through to the current Lion version. In mobile phones, I must admit that I loved the Symbian OS interface on the earlier Nokia phones. But one kind of fell out of love with the Symbian UI thanks to competition – be it Sony, Blackberry and then finally the iPhone. The point: Apple redefined design and kept pace – others didn’t. What is contemporary in design today maybe outdated tomorrow. That’s the reason why magazine & newspaper mastheads, layouts change once in a while. There’s no gainsaying that the iPhone was a game changer – be it in terms of the UI, the concept of the App Store, integration with iTunes and so on. It has forced all smart phones to follow a similar strategy – Apps running on a ‘market’, a UI that’s pretty similar to the iPhone. Among the competition, I was keenly following the growth of Android. Their strategy of offering the platform free to any handset developer as against Apple’s policy of controlling both the hardware & the software would mean that Android will garner a higher market share as they are present in thousands of handsets across the globe. Contrastingly, Apple has limited their smartphone offering to just one brand – the iPhone. Among the many thousands of Android handsets only a few have managed to garner global attention – the Motorola Droid, Google Nexus and a few others. But none has gained as much popularity as the Samsung Galaxy S2. Especially in India, where Apple has little or no halo, the Samsung Galaxy S2 probably has cult status – going by internet forum postings and the fact that demand outstrips supply. So I have been eyeing the Galaxy S2 for a while now – the big screen, bright display, reports of better versions of Android and constant ravings on Twitter were the triggers. Yes, I was biased against it. I truly believed in what Steve Jobs talked about: ‘fragmented platform’ vs. ‘integrated platform’. Also, given the vast array of handsets in which Android is installed – from a 5k phone to a 35k phone the hardware is bound to be different. Add to it the various Android versions floating around in the wild it is a potential mess. It’s quite likely that a similarly configured handset at the same price point may have 2 different versions of Android. Despite all this, Android is a huge success. So I decided to give it a try through the Samsung Galaxy S2. Overall, I think most smartphones at a particular price range offer the same competency: make calls, write & receive emails, browse the net, offer 3G, install and use Apps. So the differentiation between one smartphone and the other rests on this nebulous thing called ‘user experience’. The phone brands running Android have an additional problem – how do they differentiate each other? So HTC has HTC Sense and Samsung has a Live Panel and so on. Add to the prospect of inconsistent experience of an application across the variety of handsets – an entry level handset cannot be expected to deliver the same experience as a high end one. With all this playing on my mind, I went looking for Samsung Galaxy S2. It was sold out within a week on Flipkart. It was not available even in the exclusive Samsung outlets. And where available, costumers had to make to do with lifting a dummy handset as part of ‘checking the handset out’. In contrast, you have fully working iPhones being played around with at Apple reseller outlets. Some of the multi-brand outlets which were out of stock, actively pushed the HTC Sensation as ‘better than the S2’. To Samsung’s credit they’ve created a huge fan following and demand for the S2. But if one is not 100% sure about the brand of choice, the chances of being swayed into purchasing a competing brand is quite high. In contrast, the die-hard Apple fans are unwaveringly sure of their brand of choice. Using the S2 has been a positive experience. If you have a Gmail address, updated contact list on Gmail and a personal photos on Picasa – syncing all of it was a breeze. But there were several occasions, where I went ‘Now, how do I delete this?’ or ‘How do I update this?’ with no easy answers. For example, connecting the handset to a PC did not automatically tell me if the firmware (2.3.3) is the latest one. The phone searched for an update and gave up saying ‘connection not established’. The apps running on Samsung Apps is another area of confusion. The Samsung App has its own set of games (including Angry Birds) over and above what the Android Market offers. The UI and usage of popular news, productivity & game apps are similar on both the iOS and the Android Market. But the biggest difference I felt was in the elegance of the UI and the was ease of managing everything through iTunes. Many hate the iTunes from the bottom of their hearts but this integrated approach has saved me many a backup and made purchases easy. I have restored my iPhone and iPad several times to exactly the same state as the previous one thanks to backups on iTunes. I have re-downloaded for free several apps thanks to the one-time purchase on iTunes. I am not sure how all this will work on the Android platform. As far as elegance of UI goes, take a look at Reeder on iPad & iPhone for design unity. The Samsung Galaxy does score over iPhone 4 (some say its an unfair comparison as the iPhone 4 is a year old while the S2 is fairly recent) purely on specs and I am sure it takes better photos. I find the quality of LED flash on the iPhone pathetic – surprising that its yet so popular on Flickr. I also feel that the Android is meant for the ‘digital natives’ – those who grew up being comfortable on all things digital. But for ‘digital immigrants’ the interface could perhaps be intimidating. Things will only get better on the Android platform – more updates, features – maybe better integration of hardware & software. The iPhone has truly been challenged and it shows. 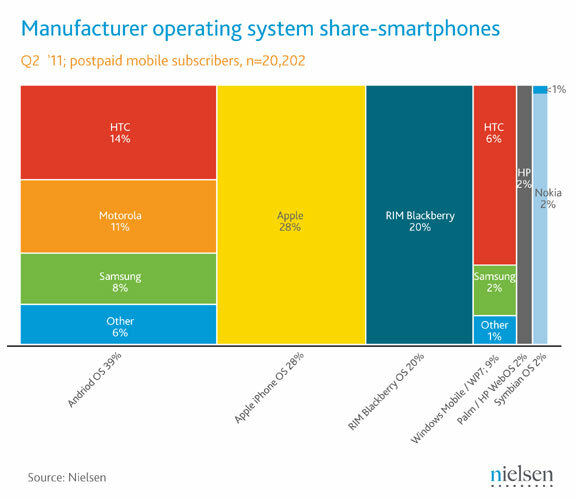 Android phones (collectively) will have a higher market share than the iPhone (its but natural – one phone model vs. 100s). It remains to be seen how iPhone fares in the future – will it be relegated to a niche market share? Even at current market shares, its share of the smart phone industry profits is huge: Apple accounts for 66% of the operating profits of top mobile vendors in Q2 2011. As an Apple fan, the Samsung Galaxy S2 tempted me to experience Android. But not enough to make me jump ship. I think Apple has the goodwill of millions of fans like me to spur further growth. It’s the fence sitters in markets like India (where Apple is not revered in big numbers) that Apple has to worry about. Nice read, . But i find the numbers published by asymco(as you have posted) look fuzzy !!.. Nice & balanced review and thoughts. The world of Andriod is logically bound to become complicated as hardware-software marriage issues crop up. For an user it will compromise on the experience. Apple is safer on that count, given its walled garden. India is a different story though, where Andriod is most likely to rule given its appeal of free and Apple’s dogged determination of not chasing even the mid-tier market. How does Win 7 – and especially if Nokia throws so of its hardware at it – impact things, I wonder. Far from being an advantage, this is one my gripes about Android – Apps running in parallel take away crucial battery power. Also, internet usage needs to be monitored since any app can potentially use the internet any time!